You can listen to my interview with Brandon Beachum below at any one of these links. Positive Head Podcast is consistently one of the top rated spiritual podcasts in the nation. I’m so honored! Welcome to the monthly installment of Deb’s Paranormal Musings! I’m the psychic on the Port City Paranormal team and love working on investigations. We think of ghosts as haunting a particular location – an old house, a battlefield, an old office building, a prison where they were tortured. We think of ghosts as haunting a particular person – a deceased mother watching over her children, a person haunting the person who killed them. We think of ghosts haunting a particular object – a favorite tea kettle, a dress, a family heirloom. All of these are true, but ghosts do more than that. Sometimes they move from place to place or person to person. Sometimes they’re curious, maybe even bored. Sometimes they’re spiteful or playful, particularly when they’ve been disturbed by paranormal investigators. Sometimes what investigators bring home aren’t ghosts, but are poltergeists, shadow people, or, unfortunately, worse. Spend some time in meditation, centering yourself and the positive intent you will carry with you throughout the investigation. The more calm and centered you are, the less likely you are to have an entity attach to you. Imagine yourself encased in a protective bubble of white light. (My visualization for this is fiberglass like on the bottom of a boat, but I’m a beach girl, so it works for me!) Use whatever works for you – a coat of armor, a spinning tornado, an invisibility cloak – whatever. Nothing can get past this armor unless you allow it. This makes for an interesting discussion – perhaps you are willing to allow an entity to touch you, or whisper in your ear. If so, you need to state – out loud – these boundaries at the investigation site before you begin the investigation. You also need to be very clear about what kind of energy you’re willing to allow within your own energy field. For example, I am willing to have a ghost touch or speak to me, but I’m certainly unwilling to have anything negative do so! There are crystals that help with finding the balance between protection and allowing information in. I carry a small piece of tourmulated quartz for this purpose. The quartz amplifies positive energy, and the tourmaline inclusions protect me from negativity. Copyright 2015 Deb Bowen. All rights reserved. For many years, medical science discounted and discredited these experiences, theorizing that such events were the result of decreased oxygen to the brain, medication, and other explainable medical conditions. While historically such near-death phenomena have been categorized as “paranormal,” research indicates that they are much more the “norm” than previously thought! Out-of-body experiences, often akin to “astral travel” have been researched extensively, particularly by Robert Monroe of the famous Monroe Institute in Virginia. Sometimes these are experienced as dreams in which the person is flying through the air “superman” style. Other times, one simple perceives him/herself to be in a different location than the one inhabited during waking hours, with no understanding of how one got there. Why do some people have out-of-body experiences and others don’t? We don’t know, but research is on-going! Join us FRIDAY, MARCH 27 at 6:30 pm at McAllister’s Deli to learn more about these topics. During the dreary, rainy days of February (at least where I live), it’s hard to be cheerful. The skies are leaden, the trees naked and dripping rain, the nights freezing. No wonder we celebrate Valentine’s Day during this month – we need love to cheer us up! However, I’m not sure Valentine’s Day always means much to our loved ones on across the veil. They love us every day. But is the day special to ghosts – those who remain earthbound? I don’t know, but I do know that some ghosts have a sense of time, a sense of the passage of time, while others do not. The concept of time for ghosts is different than for us. Some ghosts haunt a place for centuries, repeating the same pattern of behavior over and over. There is an office building I know of in another state that was built on land that formerly housed a monastery. A friar walks through the grounds each evening precisely at six o’clock – presumably on his way to evening vespers. Such a haunting is called an imprint haunting. There are ghosts who died in car accidents who appear at the accident location repeatedly at the time they died. These ghosts seem to have no concept of the passage of time or of the present. Other ghosts appear when certain circumstances trigger their presence. In an old school out west, the ghosts, who were generally ……..
Are you psychic? Are you able to influence others’ thinking? Can you send images to someone far away? Does your psychic ability beat the law of averages in knowing information? If so, this great night of experiments is for you! Port City Paranormal’s next meeting is filled with interesting information and experiments! Come join us Friday, January 23, 6:30 pm at McAllister’s Restaurant, 740 South College Road, Wilmington, NC. Precognition is the skill of knowing information using extrasensory skills. We’ll be using a fairly simple, standardized test. Six boxes will be placed on a table. Our task is to say what’s inside them. Remote viewing is the ability to send and/or receive information (usually visual) to/from someone in a separate location. We’ll concentrate on sending the image of an object to someone in another state. I mentioned in my November column that ghosts are often more active in the winter and at family gatherings. I want to expand on that this month. I spent the Thanksgiving holiday on an isolated island with my family and some close friends. This island, accessible only by ferry and small plane, has been home to many generations of a few families. It is peppered with small, family graveyards, some of them literally in the back yards of peoples’ homes! This is a place where the dead are very much present with the living every day! 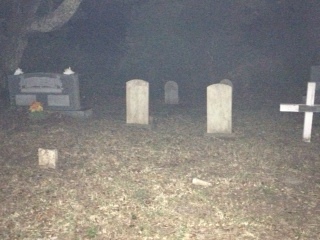 My friends and I visited several of the more public cemeteries one night (we didn’t actually enter the property, of course, but shot photos from outside the gates.) Here is a picture of an orb we caught on film. You can see it on the top right of the headstone in the right of the photo. I think the person buried here just popped in to see what we were up to. Contrary to media hype, cemeteries are, in my opinion, the least haunted places of all. Ghosts don’t want to hang around in such lonely places. They are much more interested ….. Copyright 2014 Deb Bowen. All rights reserved. On Halloween night we sat a place at the dinner table in honor of our departed loved ones and welcomed them to visit us. It’s an old Celtic tradition to host a “Dumb Supper” on this night – where no one speaks at the table and the dead are welcomed. We weren’t silent (that would have been difficult for friends who really like to talk to each other! ), but we did spend some time talking about our relatives (and four-legged family members) who had gone on to the Summerlands. It’s a lovely tradition, I think. And who doesn’t love a chilling ghost story around an October campfire? Or getting spine tingles walking past a graveyard? Or, these days, worrying about being eaten by zombies? However, when Halloween spookiness fades and all the candy is gone, those stories fall beneath an avalanche of Thanksgiving and Christmas preparations. Not so for those of us who speak with the dead regularly. We know that ghosts exist every day (yes, in the daylight – you just can’t see them as well), not just at Halloween. In fact, the winter holidays are prime times for ghosts to show themselves. Some ghosts are attracted to the chaos of family gatherings, and what’s more chaotic than Thanksgiving dinner and Christmas morning? Some ghosts are attracted to the smells they remember from those holidays – deeply-scented fir trees, pumpkin pie, roasted turkey. There’s a well-known ghost in Wilmington whose presence in the building is announced by the fragrance of sweet potato pie and pipe tobacco – favorites of his when …. I’m not superstitious. Really, I’m not. I have lived with several Zen Buddhist Masters, all of them cats (says Eckert Tolle), and a couple of them black. Just because I had a black cat named Janis Joplin who died on Janis’ birthday doesn’t mean anything, right? I don’t make X marks when a black cat crosses my path. I mean, they’re just going somewhere, right? I walk under ladders. I don’t cross my fingers and “hope to die” (how weird is that old saying!). I don’t think a four-leaf clover is any more lucky than a three-leaf one. I step on cracks on the sidewalk, and never broke my mom’s back. I don’t have paraskavedekatriaphobia, the fear of Friday, the 13th. On and on the superstitions go! But where did superstitions come from? Some of them came from the Burning Times, when the Inquisitors tried to frighten the common folk away from the wise women of the village. Here’s something to think about: when the wise women (or witches, they were called) were killed during the Burning Times, their cats also were killed. Guess what happened? The plague swept Europe, killing millions, because there were no cats to kill the rats that carried the plague-carrying fleas that bit the people. The fear of Friday the 13th has its roots during the time of the Crusades, when the Pope rounded up all the Knights Templar on Friday, October 13, 1307, torturing and putting many of them to death because the Knights had become in many ways more powerful than the Church and all the European kings. They had become extremely wealthy and were the forerunners of modern bankers. For goodness sake, hold your breath when you pass a cemetery. Otherwise, you might breathe in the soul of a recently-buried person. Really? And if you bury a woman in black, she’ll come back to haunt you (so would I!). My guess is that those who have crossed over to the Other Side laugh at our superstitions. Those who have died and remain earth-bound probably like us being a little nervous, believing ……..
A while back a friend sent me a photo she’d taken on a lovely spring day of a beautiful little country church on a rural road. She took the photo from a slowly moving car. When she developed the film, she was surprised to see a man standing next to one of the church windows. She had no memory of seeing the man when she shot the picture. On closer inspection, she saw details that stopped her heart. She could see through him – right to the clapboard siding of the church. She also could clearly see he was wearing a uniform and a cap with the letters CSA written above the visor – Confederate States of America. When she gave me the photo, my friend Joel and I did everything we could think of to it – we turned it sideways and upside down. We put it on the computer and enlarged it until it was so pixilated as to be unrecognizable. We saw what she saw, and more. While the figure clearly was standing next to the building, he was surrounded by tombstones. Like many country churches, this one had a cemetery in the churchyard. So Joel and I conducted research. We learned all we could about the church’s history and the inhabitants of the cemetery. Then we took a drive. I understood immediately why my friend took the picture. Serene doesn’t begin to describe this lovely little church. Joel and I wandered around the building and through the graveyard. We tried to duplicate the photo with one of us standing in the location where the ghost had stood, but the angle wasn’t quite right. So we walked down an embankment and shot from the approximate position at the edge of the road from which my friend shot the photo. Then we saw what she saw. 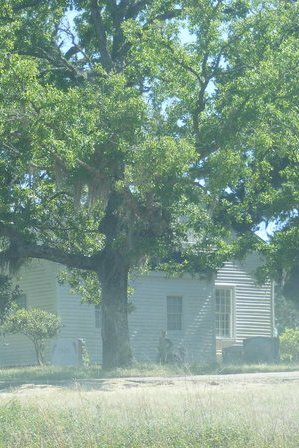 There was indeed a CSA soldier standing, not next to the church, but closer to …. In July the famed Rhine Research Center for paranormal and parapsychology research, formerly a part of Duke University, Durham, NC, hosted a panel discussion among three paranormal investigation teams. I was honored to be included in the discussion. A participant in the audience asked me if I felt an obligation to help ghosts cross over when PCP does an investigation. Below is my answer. While the primary focus of a paranormal investigation is obtaining evidence that can be scientifically verified, we on the team feel a responsibility to at least inform the ghosts we think are present that they have alternatives to being “stuck” in the location forever. Usually, at the end of an investigation, we explain – out loud – that there is hope, and light and a bright world beyond the place/person/object to which the ghost seemed attached in our world. In an investigation of a house purportedly haunted by an elderly woman, we learned that she believed she was still living in the 1950s and was there because she needed to wait for her husband and children (all now deceased) to “come home.” We explained that they were now on the other side, it was more than 50 years later, and that she could go toward a light that would reunite her with her loved ones. This information appeared to confuse and anger her (all the recorders shut down, the K2 meters went wild). After a while, the energy in the room calmed, and I could feel her presence leave us. The equipment resumed normal operation! I believe she did, indeed, cross over at that moment. For more information about Deb, visit www.debbowen.com or on facebook at https://www.facebook.com/witchesoftheshore. 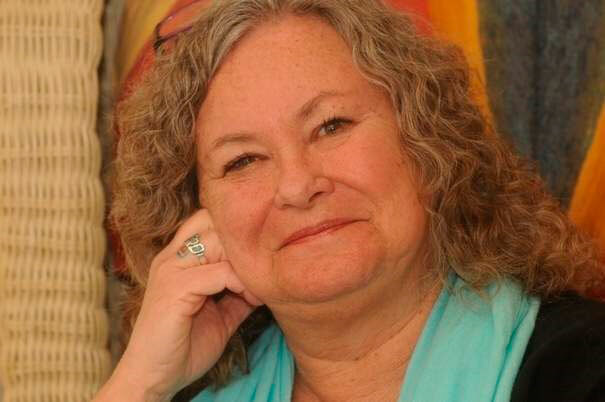 Deb Bowen is a psychic and writer who offers a wide range of services through her website, www.debbowen.com. 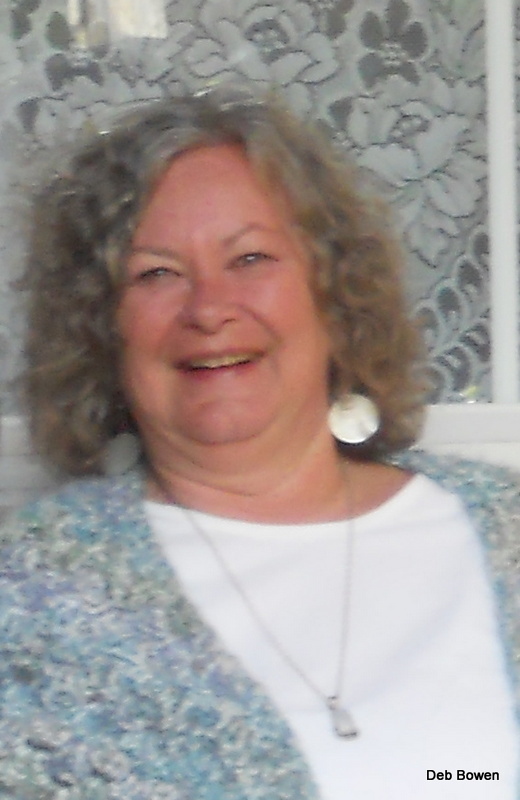 Her weekly podcast is at www.blogtalkradio.com/psychicteachers, live each Sunday at 9 pm eastern or available free from iTunes. We continue our discussion this month about communication with our loved ones across the veil – but this time our beloved pets! You know the story about the “Rainbow Bridge,” right? Pets cross over this beautiful bridge to the Other Side, and wait happily for us to meet them there when we die. I love this image, and believe it to be true. I believe animals reincarnate just like humans, but I think our pets wait to do so until they’ve had a chance to be reunited with us for a while across the veil. They also come back to visit us. Almost everyone I know has experienced the sensation of beloved deceased pets jumping on the bed in the middle of the night, or wrapping themselves around our ankles as we stand at the kitchen sink. Yes, indeed they do! So are these visitations from the ghosts of our pet? NO! They are from the Spirit of our pet. As I wrote in a previous column, ghosts are people – and pets – who have not crossed to the Other Side and haunt places and people. Spirits are people – and pets – who HAVE crossed to the Other Side and come back across to visit us. There are terrible stories of demonic animals – thank you Stephen King’s “Cujo”! and the horrible creatures at Skinwalker Ranch in Utah, just to name two. These beings are not the same as our beloved pets. I personally have – thankfully – never encountered such a being! Our pets that we loved and cared for so tenderly transition easily to the Other Side. They are free of illness, disease, and pain. They romp and play and smile. I think they watch over us and can’t wait to see us! For more information about Deb, visit www.debbowen.com. We continue our discussion this month about communication with our loved ones across the veil. This writing is in preparation for my talk at the Port City Paranormal Meeting, Friday, June 27, 6:30 pm McAllister’s Deli – FREE!! If you want to learn how to communicate with your loved ones, and learn lots more about the paranormal world, please join us! Betty’s dearly beloved father died in March. She has begged him to visit her or to give her some sign that he can communicate with her to no avail. She called me, asking if I could connect with him. Helen Greaves, in her amazing book Testimony of Light, communicates with Frances, a deceased nun who was Helen’s dear friend. Sister Frances explains in the most gentle language what happens when we die, and her “testimony” has been corroborated by so many other psychics over the years. According to Sister Frances, we are able to attend our memorial service, and to begin the transition away from our loved ones still on earth. Then we take as long as we need to adjust to our new “light” bodies. During this adjustment period we examine our last life on earth, celebrating out loving, positive actions, and asking forgiveness for our negative, hurtful actions. We then begin to move through “higher” levels (called planes) toward the Great Creator (there are many names, of course, for this being of pure love). Our movement through these planes are about us learning to become one with the Creator. Time, of course, is quite different from earth-time, so how long these steps take vary greatly on the lessons each of us needs to learn. We often need to come back to earth to complete certain lessons. We’ll discuss the reincarnation process in another post soon. Welcome to the fifth monthly installment of Deb’s Paranormal Musings! I’m the psychic on the Port City Paranormal team and love working on investigations! Jane Anderson, founder, with Doug Anderson, of Port City Paranormal, and I recently had a lengthy email exchange about psychic phenomena and spirituality. At the JUNE PCP meeting I’ll answer your questions about any related topic in person. Watch for special announcements! One of Jane’s questions was about reincarnation and ghosts, and that’s my topic for this post. In many world beliefs people live, die, go some place while they’re “dead,” and come back to Earth some time later in a different body and in different circumstances, and then repeated this cycle over and over. So what happens to this cycle if you’re a ghost? The short answer is: the cycle breaks. Ghosts exist in a limbo state. They have chosen to remain attached to a person, a place, or a situation on Earth rather than following the pattern of moving on to an afterlife in some “place” other than here. Here’s what they’re missing, at least in my beliefs. Almost every world belief has the notion that a life review occurs when a person leaves his/her body and crosses to the other side. This review isn’t meant to be a punishment for wrongs committed, but rather an accounting as to whether the person fulfilled the contract he/she created before this lifetime. A life review guides the person’s plan for learning needed while on the other side, and paves the way for plans for the next Earthly life. Think of our existence in each Earthly lifetime and the lives we live on the other side as that of a student. We learn compassion, patience, empathy, tolerance, joy, pain, love and so much more with each passing lifetime both here and across the veil. We are all a part of the Creator, and our decision to individuate away from Creator and experience the hardships of a physical life is not a decision we made lightly. We believed we needed to learn Earthly lessons for our soul’s development. When we have succeeded in those lessons, we are reunited with Creator. If we choose to stop the learning process by staying Earthbound, we cannot progress toward reunification with the Creator. Notes from the PCP Psychic. Welcome to the fourth monthly installment of Deb’s Paranormal Musings! I’m the psychic on the Port City Paranormal team and love working on investigations! When I teach paranormal phenomena workshops, I show many photos of orbs. Here are three examples. In one photo, a bright red orb spins in a dimly-lighted corridor of a famous hotel. This photo was taken with a 35mm digital camera. In another photo, a white orb with a “tail” flies through a brightly lighted dining room. In a third photo, taken at night with a flash, the exterior front of a house is the backdrop for hundreds of orbs. The latter two photos were taken with a disposable camera. Photos one and two display legitimate orbs. Photo three, while the most stunning, is of snowfall. I show these photos to demonstrate how easy it is to jump to conclusions. While I’m a firm believer in psychic phenomena, I also am a skeptic. “Disprove first, believe second” is my motto. Is there dust on the lens (the most common reason for “orbs”)? Are there dust motes floating in the air? Is there cigarette smoke swirling around? Is your finger covering the lens? What are orbs and are they real? Yes, they’re real. When we die, we become pure energy, without physical form. It takes tremendous effort to reform into something resembling a body, and even more effort to bring that form into a place where it can be seen by the naked eye, or even on film. The easiest form a person (or energy) can take is a ball, a circle. Usually, but not always, that circle is white. When an orb appears in another color (as in the hotel orb mentioned above), there usually is a manifestation of some kind of human-like emotion attached to the attempt to appear. I don’t know why that orb was red, but I can guess in a very limited, human way. That part of the hotel was being refurbished, and I have a feeling the person whose orb I saw was not happy about the changes! The orb with the “tail” appears similar to a comet streaking through the sky. The camera caught the orb in fast motion. Since it was taken in my dining room, I assume it was a parent from the other side paying me a visit. Cool, huh?! What Is a Spirit and How Do You Know? Welcome to the third monthly installment of Deb’s Paranormal Musings! I’m the psychic on the Port City Paranormal team and love working on investigations! Last month I discussed ghosts and how we know we are encountering ghostly activity. The words “ghosts” and “spirits” are often used interchangeably, and shouldn’t be. They are very different. Ghosts are people who have died and who, for various reasons, do not “cross over the veil.” Ghosts usually hang around a given location, never really leaving it. Spirits are people who have crossed over, and come back to visit us from the other side. Our loved ones sometimes come to tell us they love us, to say goodbye, to offer help in finding lost objects, to help settle family disputes, and make amends for transgressions while they were alive. It takes lots of energy for someone to cross over the veil in a form that we can see, and particularly in a form that is recognizable to us. Spirits on the other side do not have solid physical bodies, but rather are light forms. To manifest a human form is very hard work for them. I live in my deceased parents’ home. Friends often ask if my home is haunted. “Yes, but not in the way you think.” There are no ghosts in my home, but my parents’ spirits visit sometimes, particularly when they have important information for me. Soon after my dad died, he came to see me. I was awakened by the sensation that someone stood at the foot of my bed. In the very dim light coming through the windows I could see him very clearly. He didn’t look so good. He looked like I had last seen him – lying dead in a hospital bed. I heard him whisper “I love you.” I responded, “I love you too Daddy. You’re always welcome to come see me, but please look like I remember you next time you come.” He has always honored that request in subsequent visits. What Is a Ghost and How Do You Know? Welcome to the second monthly installment of Deb’s Paranormal Musings! I’m the psychic on the Port City Paranormal team and love working on investigations! I’m often asked to explain what ghosts are and how we know when one is around. Ghosts are people who have died and who, for various reasons, do not “cross over the veil to the other side.” Sometimes ghosts don’t realize they are dead, or refuse to accept that they are. Occasionally, because of acts they committed while alive, they are afraid to cross over – they believe in damnation! Some people choose to stay “earth-bound,” connected to a person, a place, or a situation. Sometimes they love a living person so much that they don’t want to leave him/her, not understanding that they can still connect with the living from across the veil. Some ghosts won’t leave because they are very protective of a house or of land. My friend Joyce’s ghost Helen is one such ghost. She even warns Joyce when the roof leaks! Some ghosts were so badly traumatized in their lives and/or at their death that they are bound by the horror or injustice of their life and death, and they seek retribution or justice. Insane asylums, prisons, and battlefields are such places. Sites of murders often are haunted. Interestingly, cemeteries are some of the least haunted places in the world. A newly-dead person may appear at his gravesite for a short time while he is in a state of confusion. Usually the ghost quickly goes on to whoever or wherever they intend to “haunt.” Ghosts usually aren’t much interested in their mortal remains! Next month: What is a Spirit and How Do You Know? Published: Wednesday, January 22, 2014 at 12:31 p.m. Last Modified: Wednesday, January 22, 2014 at 12:31 p.m.
Those paranormal-reality shows on television make ghost hunting look great, but Deb Bowen cautions it’s not all fun and games. When you leave a haunted house, Something might try to follow you home. Bowen remembers a psychic investigation one night aboard the Battleship USS North Carolina memorial. Danny Bradshaw, longtime Battleship custodian and author of “Ghosts on the Battleship North Carolina,” was about to give her a lift in his car. What happened, Bowen said, was that some kind of entity or thought form, something with extremely negative energy, had tried to hitch a ride. Unsuspecting ghost hunters can pick up invisible, immaterial parasites, Bowen said. That’s one reason she’s conducting a workshop Friday on how to protect oneself from psychic attacks for the next meeting of Port City Paranormal, the local psychic investigation unit. Skeptics of all things paranormal may have serious reservations, but Bowen is the real thing, said Port City Paranormal’s co-founder, Jane Anderson. “My job is to go on investigations and preferably not say a word,” Bowen said. Her insights are used as back-up for the audio and video recorders, the Gauss meters and other electronic gear that provide the backbone for Port City Paranormal’s investigations. Sometimes, however, she intervenes. Once, while the group was probing an older house downtown, Bowen sensed the presence of the spirit of a woman who had been alive during the 1950s. Bowen, a trained social worker with graduate degrees, talked gently to the spirit, saying that her friends and loved ones had moved on to the Other Side and that perhaps it was time for her to go as well. In the end, Bowen said, “A kind of breeze went through the house” and the readings went away. Bowen respects the professionalism of her PCP colleagues. “They’re very respectful to the forces on the other side,” she said. “They don’t yell at them like they do on TV. Not all psychic entities, though, are as benign or friendly as the spirit from the ‘50s. These negative entities can latch on to people or places, psychics say, causing loss of memory or energy, depression or anxiety. They might even manifest themselves through poltergeist phenomena: loud, unexplained noises, or objects being moved around or knocked to the floor. You can do a lot to defend yourself from such entities, Bowen said. Crystals can help. So can certain herbs. (Sage is particularly potent.) Visualization techniques often work: “Imagine yourself in the middle of a big disco ball,”  Bowen said, suggesting the mirrors on the ball reflect the negative energy and act as a shield. If you’re a Christian or a believer in some other faith, prayer is very strong, she said. People can make themselves vulnerable to psychic entities, Bowen said. Many poltergeist incidents, she explained, can be traced to a teenager in the house playing with a Ouija board or tampering carelessly with occult matters. A good housecleaning will do a lot of good. “These things thrive in dirt and chaos and filth,” Bowen said. In extreme cases, Bowen sometimes performs a cleansing or blessing. Psychic phenomena were part of Bowen’s life from an early age. “My mom talked to folks on the Other Side all the time,” she said. Bowen now does readings periodically at Poplar Grove Plantation or on request. She does podcasts and periodic workshops and telecourses. One favorite topic: Coping with “energy vampires.” Don’t picture Count Dracula or Edward Cullen – think more along the lines of Debbie Downer. Skeptical? Heck yeah! And Yet…….